Advent starts this Sunday, December 2nd and normally on a day like today I am running around to a few stores to find three purple and one pink candle. I’ve tried painting the candles, which looked like a joke. I’ve thought about ordering them online, which did not happen cause well, I am not good about that. Last year, I painted some vases and stuck a candle inside and they turned out okay. They looked really great before I actually used them, but once I did, the big candles made for a melted, black charred mess. This year, I refined it a bit and painted little votives, but this time on the INSIDE only. 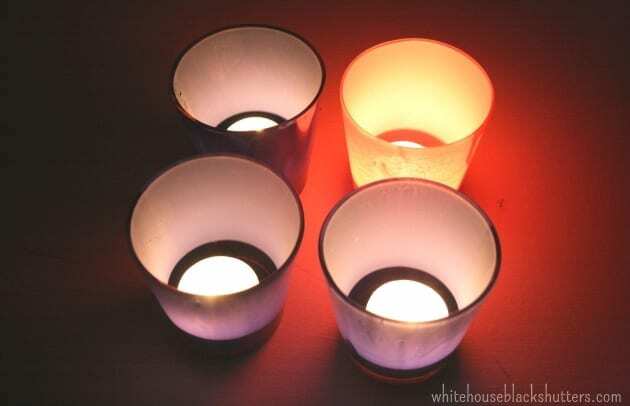 On the outside they are smooth and polished looking, at night they glow better than any candle I’ve used. I don’t have any tutorial pictures, but it was a really simple process! let paint dry for an hour, place items into a cool oven, turn oven to 350 and bake for 30 minutes. Turn the oven off and let the glass cool completely in oven. Do not use for 72 hours. We are Catholic and I always forget that so many other Christians celebrate Advent as well. Happy Advent to you, and happy early birthday, baby Jesus! 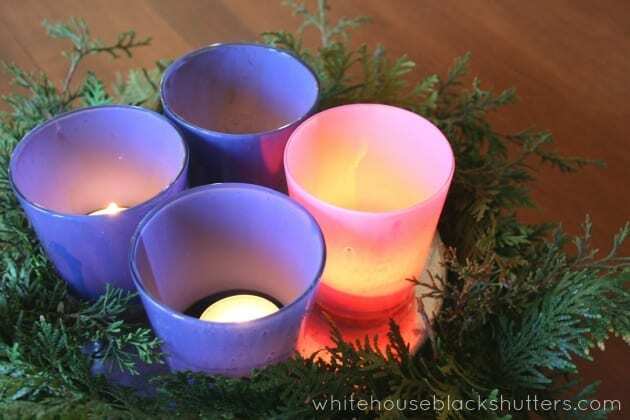 Do you celebrate Advent or have an Advent wreath? Hi. I didn’t see the instructions for curing on my MS Craft Paint bottle. Was I supposed to get a bottle with these instructions or did you find that elsewhere ? Thanks! So excited to make this. 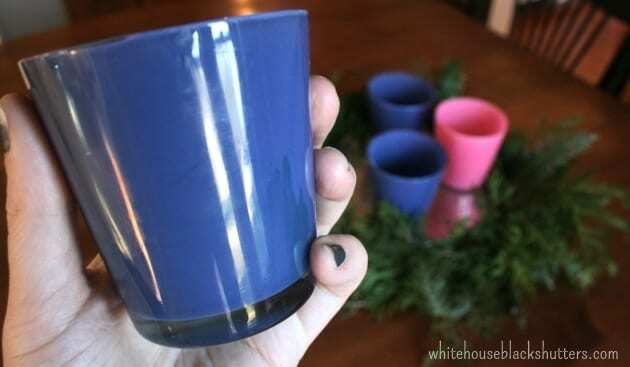 -Allow painted glass project to dry at least one hour. Make sure the paint is dry to the touch before baking. -Place project in a cool oven. -Set oven to 350° F and bake for 30 minutes. Turn oven off. -Allow glass project to cool down in the oven to room temperature, then remove. Hope that helps and thanks for asking! I’ll add these instructions to the post to avoid confusion. We’re still using these! Nice photos and nice new camera 🙂 I love this last-minute Advent idea! Yes! 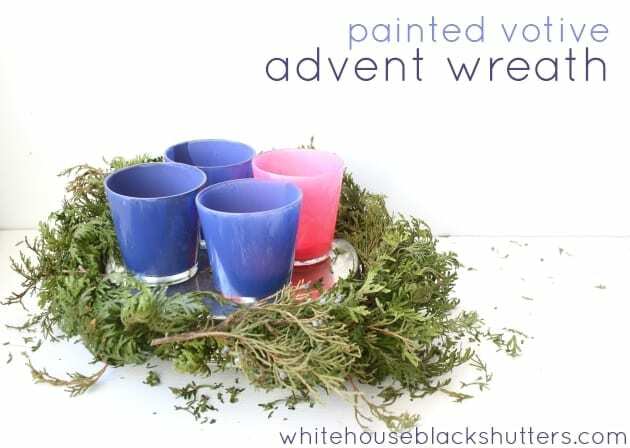 We had an advent wreath every year growing up. (We’re Lutheran.) Though to my very orderly nature, it was a little annoying to have the candles at different heights! Also, some of ours have an additional white taper in the middle as “the Christ candle.” Thankfully we made them either the Sunday before advent or the the first Sunday of Advent in Sunday School, so Mom and Dad never had to go get one. 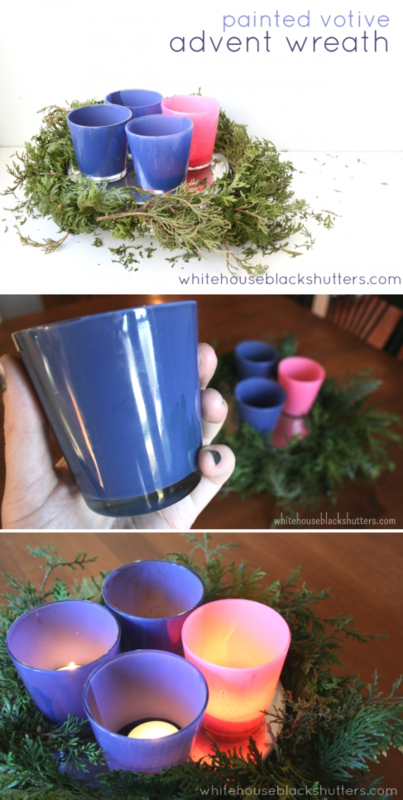 I really like the votive idea- we might be doing that at our house this year. Thanks! I’m Catholic like you and just like you I always forget to get my candles. I usually end up puttng out the Advent wreath that my son made in CCD which is made of 3 purple and 1 pink pipe cleaner and then feel guilty all Advent that I’m not a better Catholic mom! Love this idea especially since I forgot to get my candles again(!!!) and now only have tomorrow to get my wreath together (or pull out old trusty)!